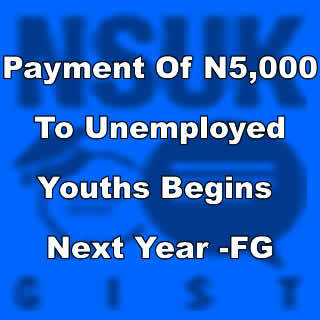 The All Progressives Congress, APC-led Federal Government yesterday revealed that the payment of N5,000 stipend to unemployed Nigerian youths will commence next year, regretting that the payment could not take off immediately because it was not included in the 2015 budget. The Minister of Youths and Sports, Mr. Solomon Dalong, made this known in Abuja when he went to commiserate with the National Chairman of the APC, Chief John Odigie-Oyegun, at the party national secretariat in Abuja over the death of Prince Abubakar Audu, the late governorship candidate of the party in the Kogi inconclusive election. Speaking with newsmen after the condolence visit, Dalong assured that APC’s government at the centre would also create more jobs to fulfill its campaign promises. According to him, “I would want the youths to understand that every promise must be backed up by budgetary provision and our promise to pay N5000 is not contained in the 2015 budget. So, definitely, it is going to begin in 2016 as we have made budgetary allocations for that.